How much compensation can I claim for an ankle injury? Ankle accidents can be devastating at times. Not only are they painful, but they can limit your mobility, lower your productivity, and have a massive impact on your quality of life. If the injury has occurred as the result of an accident, then it may be possible to recover these costs by making a compensation claim. Ankle injuries are not uncommon. Whether you’re playing sports or working in an office, a simple trip or fall can be all it takes to twist, sprain, or even fracture the bones in the ankle. This often results in bruising, dislocations, fractures, and lacerations, as well as an ankle sprain or strain. According to research publishing in Sports Medicine magazine, female patients were generally at a higher risk of suffering from an ankle injury, while younger patients such as children and adolescents also seemed more likely to require a doctor following an ankle injury. Even if you do not fit into one of these broad categories, your ankle injury may be suitable for a compensation claim. Ankle injuries which follow an accident should not be taken lightly. Such injuries are capable of causing a huge upheaval in your lifestyle and, for this reason, it is always important to consider ankle injury compensation claims. Making a claim can help you get compensation for the present and future losses that would arise as a result of the accident. It is important to note that the ankle injury settlement amount will likely depend on the severity and nature of the ankle injury. This means that a proper examination is required in order to get the exact diagnosis of the injury. In addition, the settlement claims will also take into account the length of time the victim may need to be out of work and the impact it will have on their general well being. This guide can form the starting point for any such claim. A guide to accident claims for ankle injuries. What to do if you are involved in an accident causing an ankle injury. How to begin an ankle injury claim. What can be claimed after an accident causing an ankle injury. The help required for a moderate to severe ankle fracture. What ankle bones do you have? Slip trip or fall ankle injuries. Ankle injuries caused by a road traffic accident. The most common types of ankle injuries. Accessing the severity of an ankle injury. How much compensation will I get after an accident causing ankle injury. No win no fee legal injury claims. Why choose us as your claims service for an ankle injury claim. Ankle injuries can be incredibly serious and very painful. For this reason, it is always important to consider potential ankle injury compensation claims. Unfortunately, making such a claim can be hard. For those unfamiliar with the legal proceedings required and the regulations dictating such a claim, knowing whether you might be due compensation for an ankle injury is difficult. This aim of this guide is to help people make successful ankle injury compensation claims by providing them with the required information to pursue a case. We will cover many different parts of the claims process, highlighting how each pertains to your particular case. This guide provides information on what to do if you are involved in an accident that causes an ankle injury; how to begin an ankle injury claim; and even provides an estimation tool for the possible ankle injury claim amount you might receive. In addition, the guide provides an insight into how such cases are put together and even some details on ankle injuries themselves. Going through this guide will equip you with all the information you need to know when considering all ankle injury compensation claims. If you would like additional information on the matter, we will also cover how to get in touch with our legal team. Keeping a record of any medical documentation – The severity of your ankle injury, as we will see below, will have a big impact on the amount of compensation you are awarded. Medical documentation can include doctor’s notes, x-rays, and so on. Gathering evidence of the site – If you believe your accident was caused by negligence, having documentation of the site of the accident can be helpful. This can include photographs of the place where the injury was inflicted, as well as any information regarding health and safety regulations pertaining to the immediate vicinity. Document your own injury – As well as the site, it can help to have photographic evidence of the injury which you suffered. If your ankle is swollen, bruised, or scarred, then these photos can show the full extent of the injury before the healing process has begun. Get information from potential witnesses – If your accident happened in a public place, people may be able to provide testimonies to support your case. Gather the contact details for potential witnesses as these might prove essential when you are fighting for compensation. Following the above steps can help you establish a strong case when claiming compensation. Once you have sought medical attention and decided to begin a claim, you should follow the evidence gathering steps outlined above. This can help you build the foundations of your case. With this information in hand, you can contact our team. This can be done either via our website or over the phone. After contacting our team, we will arrange for you to have a free legal consultation. During this consultation, we will listen to you and examine the evidence you have gathered. In doing so, we’ll evaluate the case with regards to successfully winning a compensation payout. We’ll deliver our verdict on the potential outcome of the case, including potential payout amounts. This also includes information on how your particular case can proceed and how we might act should you choose to hire us. If you do decide to hire our law firm, we will then begin the claims process. This will include arranging for an in-depth diagnosis from a doctor local to you, further information gathering, and making a start on the paperwork. From this point onwards, you can trust us to handle the details of the case. It is also important to note that you can also begin an ankle injury compensation claim in situations where your funds are limited. This is where our ‘No Win No Fee’ arrangement comes into play. We will explain this in greater detail below. Workplace accidents are a common occurrence. Ankle injuries can be caused by many reasons in the work environment. However, the most common reason is when a person slips, trips or falls due to badly maintained or obstructed flooring. Health and safety regulations contain weighty sections on how to keep flooring, pathways and thoroughfares safe for employees. 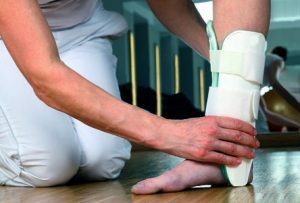 Failure to comply with these regulations, that result in an ankle injury for an employee, are a valid cause to a accident at work claim compensation. Road traffic accidents are the single most common form of accident in the UK. Although cars and other vehicles contain many safety features to protect the critical parts of the body, some body parts are not protected at all. Ankles are a good example of this. Very few vehicles have safety features to protect the lower body. If you have suffered an ankle injury as the result of a car crash, we can help you claim for damages against the person who was liable for the car accident. Slip, trips and falls are the single most common cause of ankle injuries. When this accident takes place in a public place, it is easy to overlook the fact that somebody, somewhere is responsible. Most of us wouldn’t consider slipping on some garbage on the pavement, or tripping on an uneven step, as anything other than our own fault. However, this is simply not true. Every public place is the responsibility of either the local council, or the company that provides the space. If they fail to keep it safe, a reason to claim compensation for an ankle injury after a skip, trip or fall accident will exist. General Damages: broadly speaking, this is the amount related to the pain and suffering brought about by the injury. It can be physical, emotional, and psychological pain. Care Costs: if your ankle injury has required that you hire professional care, then the costs and expenses of this can be compensated. A part-time carer, for example, can be covered by the payout. Medical Expenses: an ankle injury can require medical attention in the short and long term. This might be physiotherapy, specialist equipment, or even private treatment. Such costs can be covered. Travel Expenses: travelling to and from numerous doctor’s appointments can be costly. Rail fare and fuel costs can be accounted for. Loss of Earnings: if your ankle injury has prevented you from working, these lost earnings can be factored into the compensation claim. It can also cover potential future earnings, depending on the particular case. In addition to the above costs, our team can evaluate your case and determine whether there are any other expenses which can be compensated. This type of injury generally requires surgery. This requires the injured ankle to be set during an operation, with many sessions of physical therapy to begin afterwards. The physiotherapy for such an injury can be long and difficult. It can require you to relearn how to put weight on an ankle, as well as helping you to rebuild strength if you have been immobilised for an extended period of time. In many cases, the therapy process will begin after the immobilisation stage, as people are generally in too much discomfort to start. This start date will vary as the damage to the ankle will be taken into account in every case. Every ankle injury is different and will likely require a unique recovery program. Generally speaking, however, the combination of surgery and physical therapy can be an arduous process. Talus – this is the small bone that sits between the tibia, fibula, and the heel bone, allowing the ankle to rotate. Inside of the lateral malleolus – You can easily see and feel this bone. It sticks out from the outside of the ankle. It is the lower end of the fibula moving against the talus. Inside of the medial malleolus – This bone also sticks inside of your ankle and you can also feel it. It is at the lower end of the tibia and moves against the talus. Posterior malleolus – this is the back part of the tibia. All three of these parts must interact in a regular, healthy ankle. When one is damaged, it can cause a huge amount of pain and immobility. The single most common cause of ankle injuries is slipping, tripping or falling due to a badly maintained pavement or public walkway. No matter where your ankle injury was caused, if you slipped, tripped or fell because somebody had failed to keep a walkway safe, then you will have a reason to claim compensation for your ankle injury. Public pavements are the responsibility of the local council, and if the council fails to maintain them, and this leads to an ankle accident, you have a reason to claim. Commercial properties, such as supermarkets or shopping centres, have a legal requirement to maintain a safe environment for the public. If they fail to do so, and this leads to an ankle injury, a valid cause to claim compensation exists. Road traffics accidents and car/bicycle/motorcycle crashes are another very common way that ankle injuries are caused. Very few vehicles include safety features specifically protect the lower legs and feet. Therefore, these unprotected body parts have a much higher likelihood of being damaged in even low-speed accidents. If you have sustained an ankle injury in a road traffic accident, we can assist you in identifying the liable party, and help you pursue a compensation claim. Inversion Ankle Sprain: This happens when your ankle rolls inward or twists into an inverted state. In doing so, you stretch your lateral ligaments which, in turn, become damaged. It is one of the most common ankle sprains, though the majority of these injuries are considered to be mild. Eversion Ankle Sprain: This is opposite of the inversion ankle sprain. This sprain comes as your foot twists inwards. This affects the ligament inside the ankle. This type of injury is less common and is often more severe when compared to an inversion ankle sprain. Ankle Fracture: One or more bones in the ankle joint become broken. The injury can be so severe that it could only be corrected through surgery. In some cases, fracturing the ankle could also affect the ligaments holding the ankle joints and bones in place. This type of ankle injury could take time to heal and, during that time, your mobility will be severely affected. Ankle Dislocation: This is another common type of ankle injury. It happens when there is an unusual force on the ankle that makes the ankle flex outside the range that normal motion allows. Such a force can also lead to the fracturing of bones. Treatment can involve surgery and the attaching of plates to the bones. It takes a long time to heal. Assessing the severity of an ankle injury may be difficult. This is why it requires a professional examination. Determining a final ankle injury settlement amount will include a diagnosis and an evaluation of the severity of the injury. This not only includes current issues but issues which might manifest in the future. An ankle injury can be minor, major, or even severe and assessing it correctly will help build a case. Note that in most cases, the claimant will be required to undergo a thorough medical examination to ascertain the extent of the ankle injury and classify it properly. For our clients, we arrange for a meeting with a top doctor local to your home. We ensure that you have been provided with the most thorough examination possible, ideally preventing the possibility of unaccounted injury issues striking you in the future. How Much Will I Get After an Accident Causing an Ankle Injury? As mentioned earlier, the ankle injury settlements amount will depend on many factors. However, an ankle injury is typically compensated according to its severity. The ranking includes minor, moderate, severe, and even very severe injuries and will have a big impact on the final settlement amount. However, making a prediction regarding how much money you might receive is difficult. This is why we provide an ankle injury compensation calculator. The table below can be used to provide an estimate of compensation totals in cases where you have a moderate, minor, or severe injury. Though your case will almost certainly be different, these past averages can be useful nonetheless. Ankle Injury Very Severe £38,050 - £53,100 Causes excruciating pains to the victim. Could lead to Loss of function of ankle and requiring surgery to correct as a result of injury. Ankle Injury Severe £23,800 - £38,050 Causes a lot of damaging and a great deal of pain which could also require surgery to correct. Ankle Injury Moderate £10,450 - £20,200 A moderate injury can affect you in the long term though might not require surgery or cause long term immobility. Ankle Injury Minor Up to £10,450 Classified as minor because such injuries can heal within days, though can be very painful. Trying to fit your fractured medial malleolus into such a table can be difficult. Indeed, we recommend that people contact our offices and take advantage of our free legal consultation if they wish to acquire a better, more informed estimate of potential settlement amounts. An injury to your ankle can have huge repercussions. As well as the pain and suffering, the cost of medical procedures and equipment can be high. It can also lead to a loss of earnings. As such, the financial implications of such an accident can make claiming compensation even more difficult. We provide a solution. While many law firms will demand upfront fees and costs, we provide clients with a ‘No Win No Fee’ arrangement. This approach, known in the legal trade as a Conditional Fee Agreement (shortened to CFA), can provide financial security without the risk factor. We take the costs from the final settlement amount and only if your case is successful. This approach is designed to provide legal resources and expertise to clients without the risk, preventing them from being saddled with huge legal fees. Our ‘No Win No Fee’ agreement could be just what you need to make a compensation claim for your ankle injury. Why Choose Us as Your Claims Service for an Ankle Injury Claim? Make no mistake; being successful in any compensation claim requires a great deal of work. For this reason, professional and expert assistance can be essential. This is what we offer you when you choose us as your Claims Service. We have the expertise and experience necessary to handle any kind of compensation claim. We understand the importance of compensation to our clients and we are committed to providing the highest quality of customer service. Whether it’s arranging for you to visit a local doctor, offering a ‘No Win No Fee’ policy, or providing a free legal consultation, we want you to enjoy the full benefits of experienced and expert solicitors fighting for your compensation. If you would like to learn more about what sets us apart from the competition, contact us today. If you have been a victim of an accident that caused an ankle injury, it is advisable to start thinking of making a compensation claim. No matter the type or severity of the ankle injury, winning compensation is not only possible, but can make a huge difference to your recovery. We are here to offer help, expertise, and assistance. Our legal consultation session is free and, if we find out that your case of compensation claim is valid, we can help you settle that claim as quickly as possible. To find out more, please call 0800 073 8804 or fill out the contact form on our website. We are here to help. Most sprains and strains treated at home using painkillers you can buy over-the-counter. A broken (fractured) ankle needs to be treated as soon as possible. Find out if you can claim for a ankle injury after a slip trip or fall accident.